IPVanish is a rather bland VPN for it's steep $10 price point. However, IPVanish can combat its lack of features with its massive network spanning over 60 countries and constantly growing. Read our full review to learn if IPVanish is right for you. IPVanish is a rather large VPN service who has been providing VPN access to more than 60 countries since 2012. With over 225 servers span throughout 60 countries, IPVanish definitely ranks as one of the bigger VPN providers in the market. IPVanish sticks to the basic pricing scheme with their service, offering all the same benefits with every package. 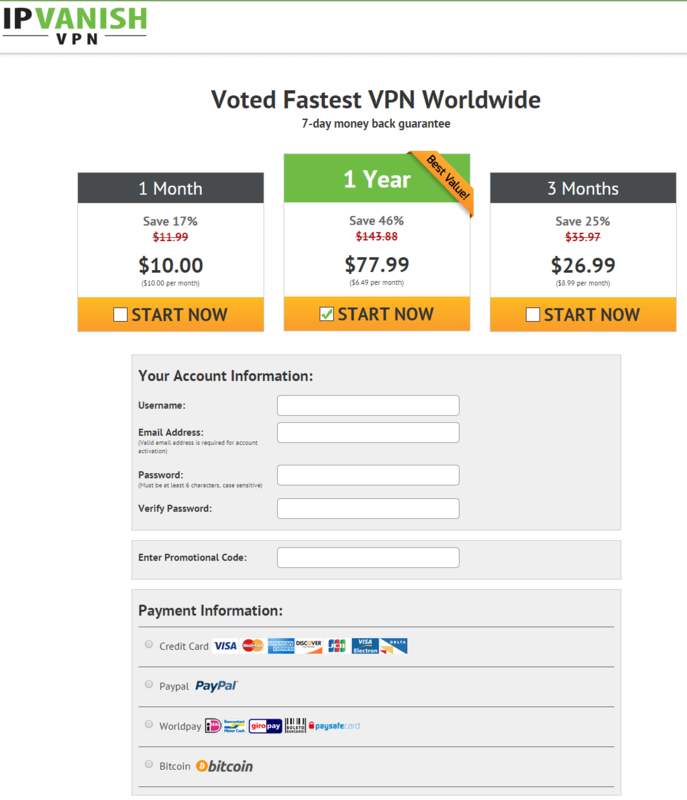 IPVanish prices their VPN service in the more ‘premium’ range, starting their smallest plan at $10, going up to $27 for six months and $77 for an entire year. IPVanish doesn’t seem to flexible with their current pricing model. However the prices not bad, they are rather on the expensive side. IPVanish is one of the more bland VPN’s who go straight to the point. As advertised per the IPVanish website, the company claims it will allow you to stream video, make VoIP calls, stop geo-targeting, protect your IP and stop Deep Packet Inspection (DPI), all features that should come basic with any VPN on today’s market. One feature we did like that was unique to IPVanish was their wide range of available clients to run their VPN on. 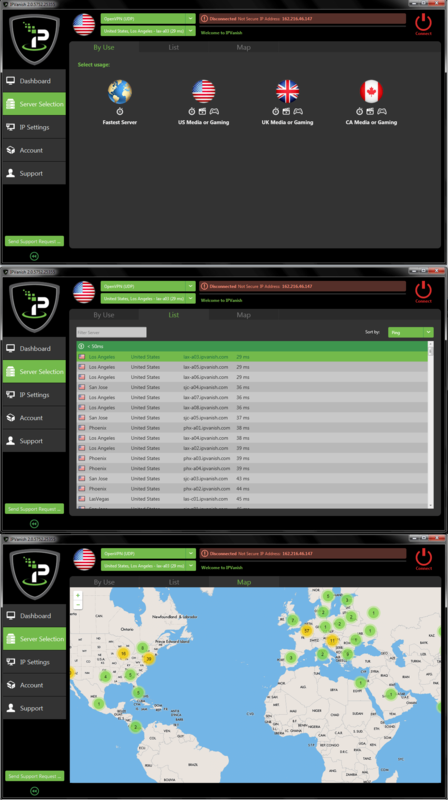 Currently IPVanish offers four client-specific VPN software for Windows, Mac OS X, iOS and Android. Also, on their website, they have a list of guides to support even more devices including Windows Phones, Unbuntu, Chromebooks and routers. IPVanish supports all versions of Windows including Windows 10, 8, 7, Vista and goes all the way back to XP. Another great feature about IPVanish is their massive network, spanning over 60 countries, with over 225 servers enabling their over 25,000 different IP addresses you can connect to. One of IPVanish’s biggest benefits in their massive network, and it continues to expand! While offering only two concurrent connections, IPVanish has a pretty steep price point for their lack in features. Aside from great VPN software that can be used across nearly any operating system, IPVanish doesn’t have a whole lot to offer in terms features outside the standard VPN. We were a bit disappointed to see IPVanish’s lack in technical details, especially for the price and size of the network, you think a website would be transparent and well-documented. Due to the lack of public information on IPVanish’s very basic policies, IPVanish VPN earns a limited score when it comes to privacy and security. One thing we did enjoy about IPVanish was the extremely fast speeds. Throughout our days of testing, we found IPVanish to have blazing fast speeds, with a majority of servers giving us our full speed with no VPN. Below are consistent speeds we saw when connecting through the IPVanish Windows client using the OpenVPN (UDP) protocol. While a majority of IPVanish servers were blazing fast, there were a small but decent sized portion with absolutely unusable speeds. However, IPVanish has multiples of nearly every server location, meaning moving onto the next gave us much better speeds. Not all IPVanish servers perform the same, so this may be something you need to consider before buying the VPN for a specific country or specific use. With great speeds, IPVanish can be used by any streamer or gamer wishing for a much faster and cleaner VPN connection. Signing up for IPVanish was a a breeze. With only a few short panels, you can have your IPVanish account up and running within just a few clicks. Lets go through the checkout process and discuss how easy it was to get our IPVanish account up and securing our Internet. To get started, you have to fill out the following information. The checkout is quite simple and IPVanish has instant activation setup, meaning when your done with the sign up, your account is instantly activated and can begin to be used! Getting into what makes IPVanish a star player, the company’s strict dedication to supporting nearly every Operating System (OS) on the market. With public support for over 8 different systems, IPVanish definitely takes the cake in the system support area. Taking a look through IPVanish’s Windows client was interesting, we found some things we did and did not like. To start, the VPN software is extremely bulky and can be a little clumsy. Now the IPVanish Windows client is okay, but the client is just to bulky and messy. While taking a look through the several different panels, we encountered little to no settings or really anything of a whole lot of use. IPVanish seems to prize themselves with their eye-catching graphics, which the Windows client is cluttered with. Navigating through the settings, there was little to no customization, no extra security features or really anything to enhance the client or product itself. The only thing we liked about the IPVanish Windows client was the server selection area, due to its simplicity and use. In the server selection area, there are three tabs. One will choose the server for you, another lets you individually choose a VPN sever and the other tab is a map, where you can click on countries and connect to one with a simple point-and-click. All three panels serve the same purpose which we found to be quite repetitive. Under the next tab, IP Settings, we found one feature throughout the client. A change your IP address every X amount of minutes, X being the time you set. 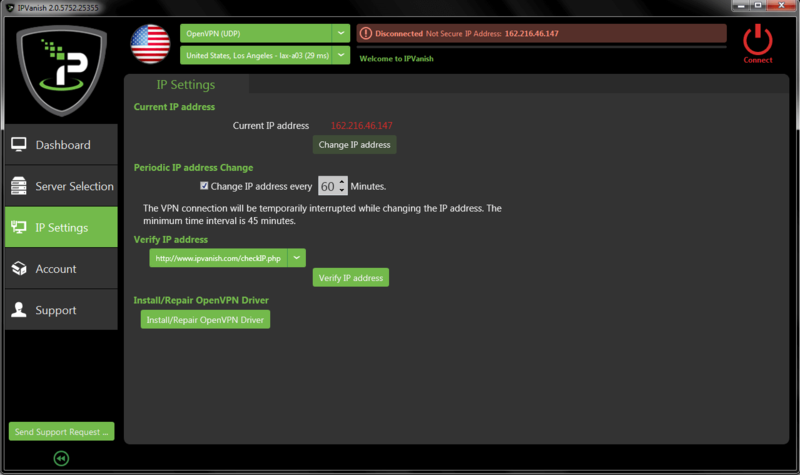 Meaning you can have your IP address change every every hour, ever 45 minutes or whatever custom time you set it to. Sadly, in all reality we don’t find the IP address change to be a huge security or privacy tool, as it simply rotates your IP. Tracking has gone far beyond basic IP tracking, however the feature can be useful if you want to keep altering your IP address automatically. The account tab was a feature we really disliked. It simply opens your IPVanish account in an Internet Explorer tab right within the client. When connecting to IPVanish via the Windows client, it could be pretty complicated or simple. If your just looking for streaming or gaming, IPVanish has you covered, but anything aside from that, your left on your own. Want better privacy? No options for recommended countries. Want to use bittorrent? No recommendations. Want to do anything outside of watch movies and play games, IPVanish doesn’t have you covered. Telling IPVanish to choose the fastest server was quite simple. One click, and a few seconds later it said the VPN was connected. All-in-All we find the IPVanish Windows client to be to big, a little to flashy, no real features or settings and it’s just kinda clunky. 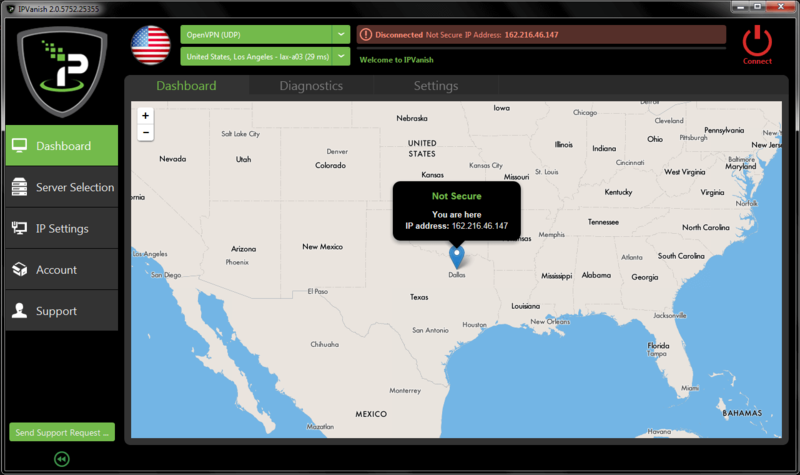 Hundreds of other VPN providers offer a variety of settings and features within their client, which IPVanish does not. All other clients look extremely similar to the Windows version, just far more condensed on mobile clients. They ran quite smoothly on devices, with no entirely noticeable hiccups. What is the VPNFTW security test? Our exclusive VPNFTW security tests will test the VPN against any form of leaks whether that be IP or DNS related. To start, we will ensure the VPN is masking our IP, then we will ensure the DNS is not leaking. All of these tests are performed with the VPN freshly installed out of the box, no settings altered. If you want to run the VPNFTW security test on yourself head over to check if your VPN connection is secure. To start, we will do a basic and extended IP address test. This will run Java and Flash applications installed on your computer, allowing you to really know if your VPN is securing everything. We have Flash and Java uninstalled for security reasons, but the site will request the plugin, and see if the VPN is masking connections flowing through. First test, pass. No form of IP leaks. Now onto our DNS leak test. No leaks with the DNS either. 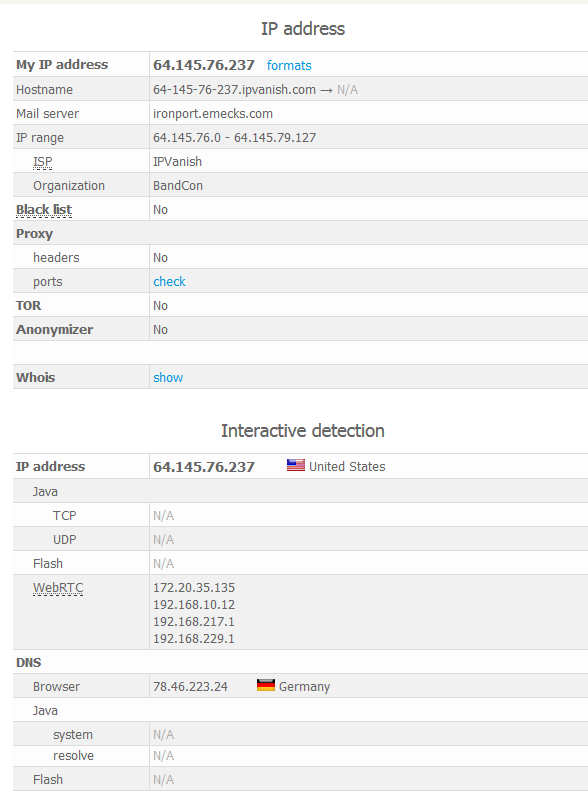 It appears after connecting to a variety of servers we got stuck on a USA and German DNS. Disconnecting and restarting the connection is as easy as one click. Customer support was not an area we had to deal with this time, but in the past, customer support is quite basic. It’s the general ticket system and representatives will try to fix your issues. Overall we were not impressed with IPVanish. With little to no features and an expensive $10 price point, IPVanish reminds us of just another VPN on the market with nothing special to offer. With servers spanning the globe and a network the size of a corporation we expected more from IPVanish. The service does have its pro’s and con’s, we just feel IPVanish doesn’t bring enough to the table, again, especially for its steeper $10. However, if your looking for a dry VPN connection with fast speeds, IPVanish will be your best bet. Take me to the official IPVanish website!